Recently I got a chance to read Love Trumps All!, a book by debutante author Sudarshan Mahabal. The book is set up in the backdrop of IT (Information and Technology) industry and the dream of many Indians to settle in the USA. This book explores the first-hand account of cultural crossovers in a balanced manner. Book Title : Love Trumps All! First thing first, let us take a look at the cover page of the book. 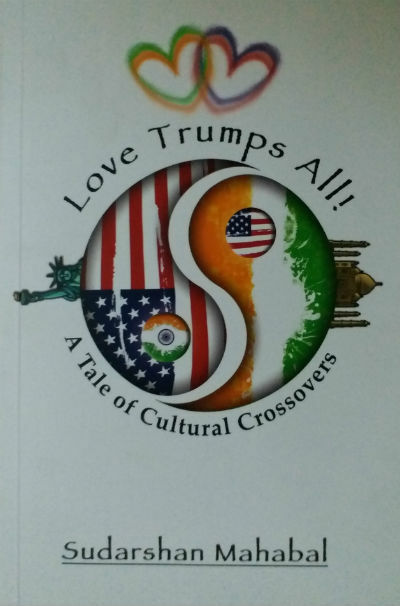 The cover page is simple and shows the cultural crossovers through the flags of India and USA. It is not much attractive though. Anant Joshi is a happy-go-lucky young boy living in a small town in India. He is clever in his studies and lives happily with his family and friends. Madhura is his school friend and belongs to a little upper-class family in comparison to Anant. After finishing the school Madhura insists Anant move out from the small town and goto a metro city like Mumbai. Actually, Madhura was going to Mumbai for further studies and Anant was too attached to his family to leave it. Convinced by Madhura, Anant decided to go to Mumbai. Coming to Mumbai was a life-changing experience for Anant. Mesmerized by the city and the way of life there Anant, however, didn’t lose his path and never forget his goal. He paid full attention to the academics and remain closely in touch with Madhura who is living in the same city. For Madhura, their friendship is blossoming into love, Anant however, was focused more on his goal. Along with doing his day job, he started attending the computer classes. Actually, the Y2K problem is knocking the doors as the millennia is about to over. A large number of IT programmers are needed from around the world to take care of it. Actually, in early days, the programs and databases were made in a way that a date field store 2 digits for the day, 2 digits for the month and 2 digits for the year. So, year 1991 is stored as 91, for example. Now with the changing Millenium if year 2000 or 2001 is just stored as 00 or 01, then a system will treat it as 1900 or 1991 respectively. It is going to create a huge chaos. So the date fields and programs need to be updated to store 4 digits for the year. As the problem is set to arise from the year 2000, it is known as Y2K problem. Anyway, Anant gets himself educated in the IT field and one fine day, which happens to be the birthday of Madhura, Anant breaks the news to her that he is going to the USA as he got a nice opportunity in IT field. Madhura was expecting Anant to propose her on that day and dreaming to get settled with him, so this came as a shock to her. Anant tried to explain the things to her but eventually, they are departed. See, how the karma plays with you! There was a time Anant when Anant wanted to live in a small town with his family and Madhura insisted him to get out of the well to explore the world, and now he is living the country by biding adieu to her as well! Anant’s personal and professional life is changed in the USA. He saw both, the brighter and the darker sides of the USA and found some friends for the life there. How the cultural crossover happens to him and changes his life, is better to explore in the book. Being a data scientist and working in IT field, Sudarshan himself has experienced the life in the USA and India and thus the book gives you an authentic account of the same. The author, however, clears that it is not his own story. The characters are developed in an effective manner. You can see the authentic portrayal of real-life people, rather than any filmy portrayal. While to avoid spoilers I cannot tell much about many of the characters and incidents which I found interesting in the book, I can definitely touch some of them. The book explores the pros and cons of both the material and minimal lifestyle. While in America, the protagonist misses the warmth of relations and found himself turning into a consumer, reflecting the capitalist way of life there. At the same time, when in India, he witness the chaos and unruly behaviour as well. So, rather than glorifying any culture, the author tries to represent them in as-is manner. While reading this book you can see how Anant feels when he lands in Mumbai for the first time and how he feels when he saw beggars in the USA. The book has many cultural crossovers to witness, be it Hindu-Muslim inter-caste marriage, second marriage of the father and its impact on his children, the perks of living in a joint family, the awakening to find a cause to do more to make the world the better place, establishing a company,… the list is long. The author tries representing things in adaptable and authentic manner throughout. The characters are strong and there is no gender bias. I often wonder, how so many writers present crap in the name of gender-equality or so-called feminism. Don’t you think that gender equality has nothing to do with the length of cloths or sexual behaviour? It is all about having an adaptive mindset and having unbiased opportunities to utilize the talents one has. In addition to effectively written characters, the importance of relations and how one can or should remain true to them is explored nicely as well. The author tries showing the shades of emotions in every relation and he does it convincingly. The way Sameera goes ahead to bald her head for her cancer-victim friend and the way in which her family and in-laws reacted to it is quite fascinating. The book also explores the passion and visionary hard work required to build a successful career and a company. The way a leader finds potential in his employees, the way he analyses the opportunities and takes decisions, the way colleagues became friends for life and remain so, the way grand-children are nurtured by the grandparents; all these things are rare to be seen in a single book. The way the Indian engineers are regarded in foreign countries. The way Sameera refers her children as her most precious jewels. The realistic way in which a small car accident and party in Pune by white people living in the society; explored. It feels like we have been living in a five-star hotel for years and missing the warmth, ups and downs of a home. … he looked at the city that slept under the blanket of yellow street lights. The city reminded him of a cranky, overtired child who finally falls asleep after a whole day of mischief and tantrums. They seem to be like moths flying fatalistically into the flame – attracted from their dark homes to the lure of the neon city lights of Mumbai. Mothers are taken for granted and I look like an idiot talking about all the stress I undergo to get them ready in the morning. And now… ‘welcome’ home and that too with a smile and a polite hand gesture showing me the direction just in case I missed where ‘home’ was. Time had changed! or should I say, my status has changed. Make peace with your family! Make peace with your past! That’s the only way to make peace with yourself! Business is not about technology. It’s about ideas. Technology is an enabler to something bigger and more fundamental. Your skills make you an amazing software engineer, but if you want to go higher, you will need to develop other skills to increase your understanding of business. And he had more potential than he thought. He could think of the big picture and connect the dots. Isn’t that what we see in a potential leader? The author tries covering almost everything he can in the book. And it is the positive point which can be a let down for many readers. Most of them are going to read this book as a love story and this book is much more than that. So, some of the readers will find the book losing pace or becoming boring or leaving the track, at places. These days, a large number of readers love to go for some short reads and coffee table books, they may not find this book very interesting. Sudarshan spent a remarkable time in the USA and is visible in his writing too. For example, he used “10 rupee bill” phrase (page 29) for 10 rupees currency note. Indians don’t use the term “bill” for currency notes, it is a term used in the USA. Overall a nice book which talks about cultural crossovers. Some of the readers may find it lengthy and trying to cover too much, and thus not remaining on the same track. It is not a light read but is definitely worth reading. We would like to give it 7 out of 10 stars.